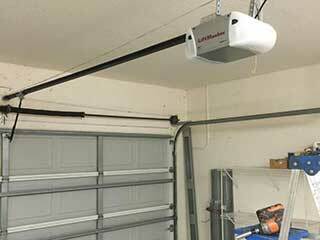 It’s easy for your garage door and its many parts to become overworked and wear out. After all, they are working for you each and every day, many times a day. That’s why it’s essential to keep them in top condition, to ensure proper operation, safety, and to extend the life of the system. At Garage Door Repair Pearland, our professional technicians can look after this maintenance, helping you keep your door operating properly and safely. The upkeep of your system includes some of the following components. The rollers that move the door and the tracks they roll in are key parts of the system that hold the weight of the door and ensure it moves smoothly. We will check this entire system for you. We look for any loose bolts and screws in the mounting brackets, and tighten or replace if necessary. We check the tracks themselves, ensuring they are aligned at the proper level. If they aren’t aligned properly, we have the correct tools to adjust them. We also check the rollers and repair or replace as necessary. The many parts that work together to open and close a door require regular lubrication to keep them running smoothly. We know what parts need care and we know how to care for them. We also know how much lubrication to use, because too much can gum up the parts. For instance, the rollers and the hinges to which the rollers are attached require lubrication. So do the hinges in the door panels, as well as the pivot points, springs and bearings. Let us manage this upkeep for you. The springs and cables of your door play a big role in the operation of the system, and they are under a lot of weight and torque. As a result, they require close inspection. Our professionals can test and adjust the tension of the system, and handle any repairs or replacements as necessary. This is dangerous maintenance to handle on your own, because of the weight and torque. We have the special tools to do this work quickly and safely, so call us to look after this for you.